What is the System of Classification of Animal Kingdom? 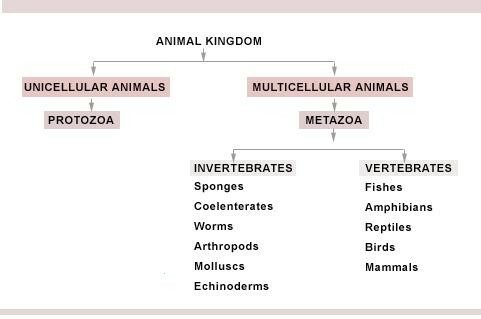 Animal kingdom comprise of multicellular eukaryotic animals and is one of the kingdoms among five kingdom scheme of classification (by Whittaker). There is a distinction in form and type of various animals; there are a few important characteristics that are regular to different organisms. These components include, Body symmetry, Nature of coelom, Arrangement of cells, Notochord, Patterns of circulatory, digestive and reproductive frameworks, Segmentation and Arrangement of cells in germ layers. The above mentioned attributes that are discussed in details as follows are the basis for the characterization of animal kingdom. Every one organisms of the Animal kingdom is multicellular still they don't display the same example of cell organization. Cellular Level of Organization – In such animals the cells are organized as free cell lumps. This sort of cellular organization is mainly seen in sponges. Illustration: Sponges. Tissue Level of Organization – Animal cells show division of exercises amid themselves. Cells carrying out the same capacity are organized as tissues. Illustration: Coelenterates. 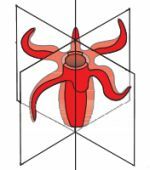 Organ Level of Organization – Animal tissues carrying out similar capacity are grouped to shape organs. Every organ is specific for particular capacity. Illustration: Platyhelminthes. Organ framework Level of Organization – In animals where organs have related to shape functional frameworks where every framework is related with a particular physiological capacity are said to display organ framework level of organization. Example: Molluscs, Annelids, Echinoderms, Arthropods and Chordates. Organs frameworks in various animal groups display different examples of complexities. Digestive System – There are two forms of digestive framework Complete and Incomplete Digestive Framework. Incomplete Digestive Framework – This form of digestive system has one and only opening to the outside of the body, i.e., a solitary opening serving as both mouth and rear-end. Illustration: Platyhelminthes. Complete Digestive Framework – In this form there are two different openings to the outside of the body, a mouth and a rear-end. Illustration: Arthropods, Chordates, and so forth. Circulatory System – Circulatory framework might be of two sorts - Closed Type and Open Type. Open Type – In open sort circulatory framework the blood is pumped out of the heart and all the cells and tissues are straightforwardly washed in it. For Example: Arthropods, Mollusca. Closed Type – In this kind of circulatory framework, the blood is flowed through a progression of vessels of shifting size and diameters - the arteries, veins and capillaries. For Example: Vertebrates. Categorization of animals can be done on the premise of the symmetry of their body. The course of action of body parts around a main line or point decides the symmetry. Asymmetrical - a few animals can't be partitioned into two equivalent parts along any plane going through the focal point of the organism. Asymmetry is the finished nonappearance of symmetry. Illustration: Sponges. See figure on the right. Radial Symmetry – Animals tend to display spiral symmetry, when any plane going through the focal  pivot of the body partitions the organism into two indistinguishable parts. Illustration: Ctenophores, Coelenterates, and Echinoderms. See Figure on the left. 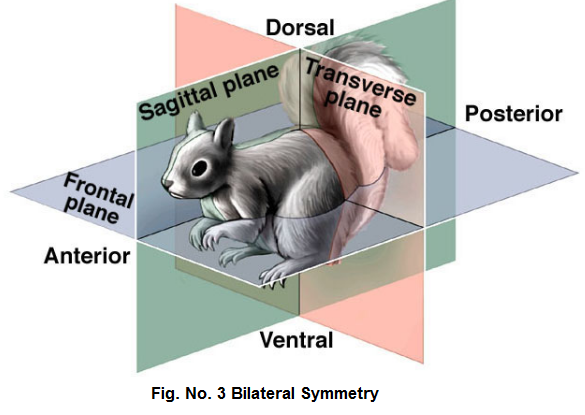 Bilateral Symmetry – Animals where body can be partitioned into indistinguishable right and left parts are known to be bilaterally symmetrical. Illustration: Annelids, Arthropods,etc. See Figure below. Body wall of animals is organized in two or sometimes three embryonic layers. Therefore animals are either diplobalstic or triploblastic depending upon the presence of the number of layers. Diploblastic Animals – Such animals in which the cells are orchestrated in two embryonic layers are called Diploblastic animals. They have an outer ectoderm and an inner endoderm. The center mesoglea is an undifferentiated layer present between external ectoderm and center mesoderm. Illustration: Coelenterates. Triploblastic Animals – Such animals in which the cells are orchestrated in three germinal layers, the external ectoderm, inward endoderm and the third germinal layer mesoderm which is present in between the External Ectoderm and the Endoderm are called triploblastic animals. 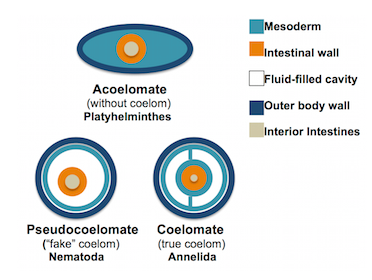 Illustration: Platyhelminthes to Chordates. The appearance or nonappearance of a body cavity in between the gut wall and the body wall is critical trademark for classification. 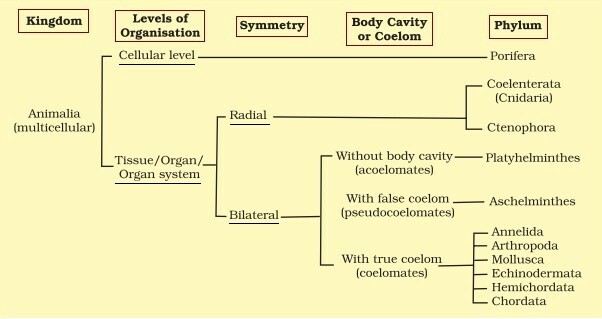 Coelom is the body cavity that is lined by the mesoderm. There are three sorts of animals in light of the kind of coelom - Acoelomates, Pseudocoelomates or Coelomates. Acoelomates – Such animals in which the body cavity is truant are called acoelomates. Illustration: Platyhelminthes. 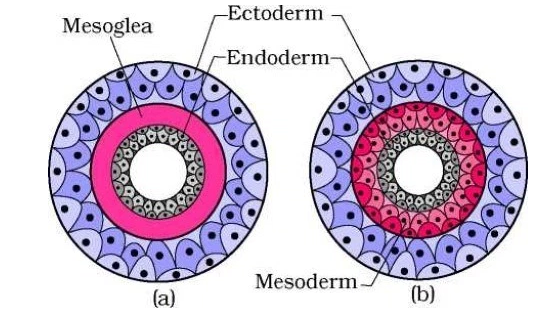 Pseudocoelomates – Such animals where the body cavity is not lined by the mesoderm, rather the mesoderm is available in scattered pockets in the middle of the endoderm and the ectoderms are called Pseudocoelomates. Illustration: Aschelminthes. Coelomates – Such animals which have the body cavity lined by the mesoderm are called Coelomates. Illustration: Mollusca, Annelids, Echinoderms, Arthropods and Chordates. In a few animals, body is segmented from inside and outside, with serial redundancy of few organs. This incidence is known as Metamerism and the Segmented body example is called Metameric Segmentation. Illustration: Earthworm. In a few animals amid embryonic evolution, a mesodermally determined pole like structure is shaped on the dorsal side; this is referred to as notochord. Chordates are the animals which have Notochord and Non- Chordates are the animals which lack notochord. Illustration: Porifera to Echinoderms. There are a wide range of animals which are comparative and distinctive to each other in numerous angles. Individuals from a specific group of animal share a specific trademark that is typical of every one of the individuals from that group. This is the component that characterizes the group. Scientists orchestrate organisms into groups on the premise of attributes which they impart to different animals and the hereditary association with each other. This orderly type of animal classification is the premise of scientific classification (taxonomy). Present day taxonomy depends on physical qualities and hereditary attributes. Systematics is the branch of scientific study that spotlights on transformative connections between living organisms. Swedish botanist Carolus Linnaeus (1707-1778), was the discoverer of Modern System of Scientific Classification. He planned his arrangement of classification such that every animal and plant he portrayed had stand out name and this name would not be imparted to any other organism. The frameworks most researcher use classify every living thing into seven groups or taxons. They are sorted out from the broadest to the most particular category. These classifications in the hierarchical framework are from top most and most comprehensive to the lowest and more particular are:kingdom, phylum, class, order, family, genus and species. Kingdom – Kingdom is the most astounding essential division in which all articles are set. Animal Kingdom involves all animals in the world. Phylum – Each kingdom is separated into smaller subdivisions called phyla. For Example: Chordates are a phylum with individuals having the notochord. 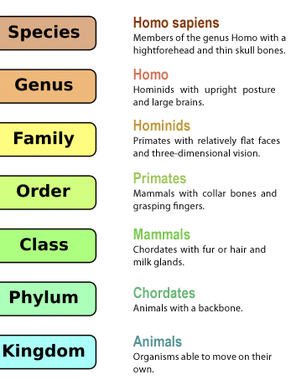 Class – Chordates are further separated into classes, For Example: Mammalia, Birds, Reptilia, and Amphibians. Individuals from every class have attributes that they impart to the individuals from the same class yet are not found in individuals from different classes. Family – Classes further are separated into families. Families contain more than one genus. Genus – Families are sub-partitioned into genera. Animals that have the same genus are fundamentally the same as and most likely developed from the same common predecessor. Species – Species is the most crucial and contains only one kind of animal. Animals are divided into two central groups: invertebrates (without spine) and vertebrates (with spine). Spine or notochord is the detectable component which characterizes whether the animal is vertebrate or invertebrate. Insects, starfish, spiders, obelia, sponges, worms are the sub-groups of the Invertebrate group, they don't have a spine. Mammals, birds, snakes, frogs and fishes have a spine and are the sub-group of the Vertebrate group.